Coinspeaker partnered with ICOBox to provide our readers with this weekly analysis conducted by Professor Dima Kornilov and Dima Zaitsev devoted to cryptocurrency and digital assets markets over the last week (December 11-17, 2017). This report presents data on the cryptocurrency and ICO market changes that took place in the third and fourth quarters, with special emphasis on an analysis of the changes that have taken place since the beginning of December 2017, including over the last week (December 11-17, 2017). ** After December 1, 2017, the structure of the cryptocurrency market changed, so the subsequent figures of the ZAK-4 index were calculated using the cryptocurrencies Bitcoin, Ethereum, Bitcoin Cash, and Ripple. *** Due to changes in the top eight cryptocurrencies by capitalization since December 1, 2017, the ZAK-8 index was calculated using the cryptocurrencies Bitcoin, Ethereum, Bitcoin Cash, Ripple, Litecoin, Dash, IOTA and Cardano. During the period from December 1-17, 2017, total cryptocurrency market capitalization increased by more than $270 billion, from $305.1 billion to $579.5 billion (as of December 17, 2017, 00:00 UTC, see Table 1.1). Figure 1 shows how the anticipation of the launch of Bitcoin futures affected the change in total market capitalization. We give an analysis of the change in demand for cryptocurrency on December 10, 2017 (prior to the commencement of trading in Bitcoin futures on the CBOE (Chicago)). At 00:00 UTC on December 10, 2017, cryptocurrency capitalization equaled $416.9 billion (see Table 1.1). Over the next four hours market capitalization fell by more than $50 billion, and by 04:00 UTC on December 10, 2017, equaled $363.6 billion (see fig. 1). 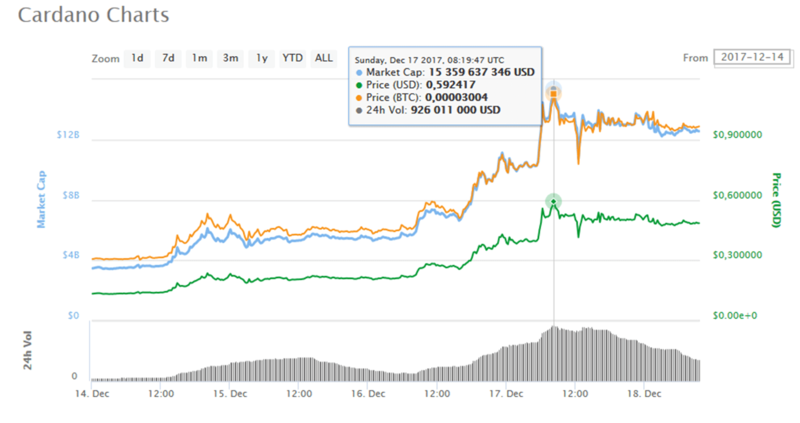 However, by the start of the day on Monday (December 11, 2017, 00:00 UTC), the market had rebounded to $411 billion, and a significant increase in capitalization growth to $579.5 billion was subsequently seen (December 17, 2017, 00:00 UTC, see Table 1.1, fig. 1). Over the past week (December 11-17, 2017) market capitalization increased by approximately $160 billion, with Bitcoin, the capitalization of which increased from $253.8 billion to $326.1 billion, accounting for $70 billion of this increase. The growth in altcoin capitalization over the week equaled approximately $90 billion, from $163.1 billion to $253.4 billion. During the period from December 10-17, the exchange rates of Bitcoin, Ethereum, Bitcoin Cash, and Litecoin increased by 28.4%, 47.3%, 28.4%, and 93.9%, respectively. Last week saw the appreciation of all cryptocurrencies in the top 20, except IOTA. Special mention should be made of the significant increase in the capitalization of Litecoin and Cardano, which took 5th and 6th place in the list of cryptocurrencies by capitalization. The Litecoin exchange rate, for example, increased from $98 to $300-320 over the space of ten days (December 8-18, 2017), i.e. it more than tripled (fig. 2), while the Cardano exchange rate increased by 350% over the space of four days (December 14-18, 2017), from $0.13 to $0.59 (fig. 3). According to the data of CoinTelegraph, the Bloomberg Terminal system has added Ripple (XRP), Ethereum (ETH), and Litecoin (LTC), in other words users can now analyze their financial indicators in real time. Banks in Japan and South Korea are testing Ripple blockchain-based payments (see Table 1.5). As a result, the Ripple (XRP) exchange rate appreciated over the week (December 11-17, 2017) by a factor of three, from $0.25 to $0.75, and the Ethereum (ETH) exchange rate increased from $450 to $700. In general, the appearance on the cryptocurrency market of new risk hedging mechanisms (futures contracts) has had a favorable effect on market trends. However, total trading in Bitcoin futures on the CBOE over the past week was not large compared to total cryptocurrency capitalization. Therefore, it will be interesting to see how the start of trading in bitcoin futures on the largest commodities exchange in the world, CME Group, which is planned for December 18, will affect the bitcoin exchange rate. At the same time, news concerning the possible launch of Ethereum and Litecoin futures has also appeared (see Table 1.5). Two hard forks took place somewhat unnoticed against the backdrop of all these events and the significant growth in the cryptocurrency market: Super Bitcoin and ECIP 1017 (fig. 4). The website of the Super Bitcoin project notes that the hard fork is “experimental”. The ECIP 1017 hard fork took place in the Ethereum Classic network. Now, as expected, the total supply of this cryptocurrency will be reduced by 20 million units, to 210 million, thanks to the implementation of a deflationary monetary policy model. You will recall that prior to this, on November 24th, a Bitcoin hard fork was performed that resulted in the appearance of the Bitcoin Diamond cryptocurrency. The main reasons for the changes in the exchange rates of the leading cryptocurrencies over the last week are given in Table 1.3. The Smith + Crown Index increased over the indicated period from 25,891 to 34,989. To analyze trading activity on cryptocurrency exchanges, the ZAK-n Crypto index is calculated (see the Glossary). The values of the ZAK-4 Crypto and ZAK-8 Crypto indices are presented in Tables 1.1, 1.2.a, and 1.2.b. For example, on December 14, 2017, the 24-hour trading volumes (Volume 24h) for the four dominant cryptocurrencies (Bitcoin, Ethereum, Bitcoin Cash, and Ripple) exceeded $26.7 billion (Table 1.2.a). The value of the ZAK-4 Crypto equaled 6.9%, which attests to the extremely high liquidity and market dynamism of the dominant cryptocurrencies. The 24-hour trading volumes (Volume 24h) for the eight dominant cryptocurrencies (Bitcoin, Ethereum, Bitcoin Cash, Ripple, Litecoin, Dash, IOTA, and Cardano) reached $20.4 billion at the end of last week (Table 1.2.b), i.e. 4.1% of their market capitalization. The ZAK-4 Crypto and ZAK-8 Crypto indices are considered in more detail in Tables 1.2.a and 1.2.b. Table 1.3 shows the key events of the week (December 11-17, 2017) having an influence on the exchange rates of the dominant cryptocurrencies and on the cryptocurrency market in general, with an indication of their nature and type of impact. Below is an analysis of the daily changes in the Bitcoin, Ethereum, and Bitcoin Cash exchange rates since the start of December (Tables 1.4.a, 1.4.b, and 1.4.c). The Bitcoin exchange rate surpassed $20,000 for the first time on December 17, 2017. Since the start of December (December 1-17, 2017), the Bitcoin exchange rate has appreciated from $10,198.60 to $19,140.80, and the Ethereum exchange rate from $445.21 to $719.98 (Tables 1.4.a and 1.4.b). The highest Bitcoin and Ethereum exchange rates ($20,089 and $735.80, respectively) were recorded on December 17, 2017. The largest fluctuations in the daily range (Range) of the exchange rates of Bitcoin ($4,016.50) and Ethereum ($152.80) were recorded on December 8, 2017, and December 12, 2017, respectively. Since the start of 2017, the Bitcoin and Ethereum exchange rates have increased by a factor of 19.17 and 88.12, respectively (see Tables 1.4.a, 1.4.b). The price trends of Bitcoin, Ethereum, Bitcoin Cash, and Ripple (the top four by capitalization) in December 2017 are given in figures 5, 6, 7 and 8. 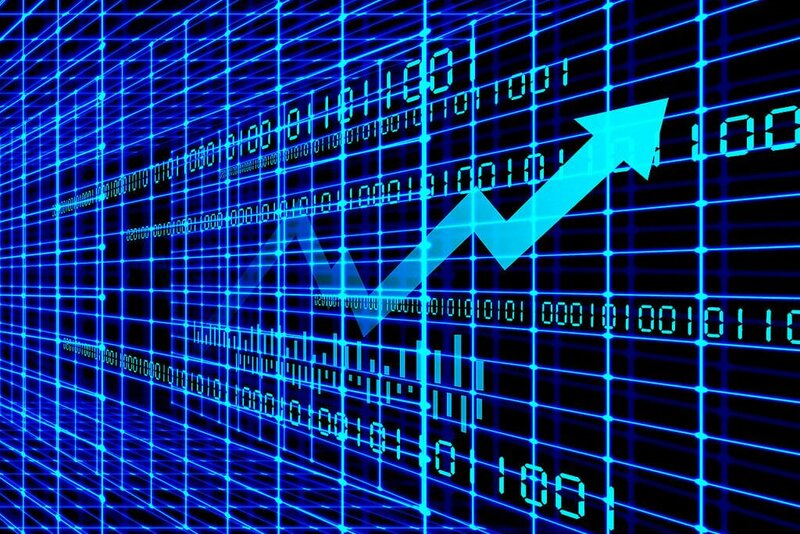 According to the data given in figures 5, 6, 7, 8, the intensive growth in the Bitcoin exchange rate during December 6-7, 2017, was accompanied by a drop in the exchange rates of Ethereum and Bitcoin Cash, while the downward adjustment of the Bitcoin exchange rate on December 8, 2017, led to an increase in Ethereum and Bitcoin Cash. Over the 2-4 days after December 11, 2017, there was intensive growth in the presented cryptocurrencies, followed by a downward adjustment of the exchange rate. The overall index of Bitcoin Cash exchange rate change from August 1, 2017, equaled 4.9 (the rate of $380 at the close of the day on August 1, 2017, was taken as the basis for the calculation), i.e. during the period after the Bitcoin hard fork and the appearance of the new Bitcoin Cash cryptocurrency its exchange rate has increased by 390%, with most of this growth taking place since the beginning of November. In December the exchange rate has ranged from $1,226.20 to $1,939.90. As mentioned earlier, Bitcoin Cash now holds third place in terms of capitalization, which equals $30.5 billion. The weekly cryptocurrency and digital asset market trends from July 2, 2017, to December 17, 2017, are presented as graphs (Fig. 1.1-1.5)*. 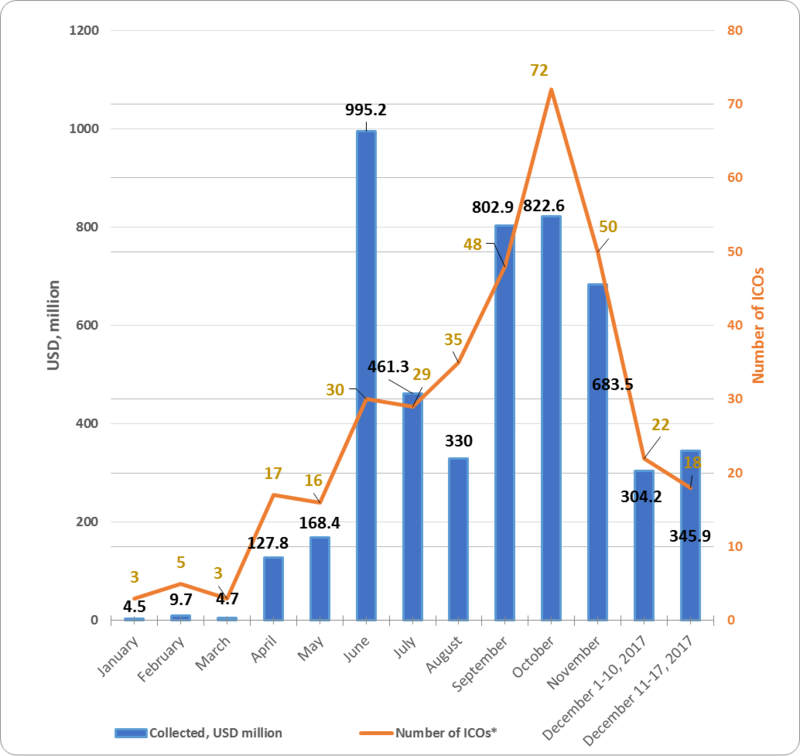 Number of cryptocurrencies and digital assets Fig.1.3 This figure shows the trends in the increase of the number of cryptocurrencies and digital assets circulating on cryptocurrency exchanges. On January 1, 2017, their number was 617, and as of December 17, 2017, this number had already reached 1,325. ** Average daily data For example, at 00:00 UTC on December 10, 2017, cryptocurrency market capitalization equaled $416.9 billion (see Table 1.1), but by 04:00 UTC it had fallen to $363.6 billion, so the average daily value equaled $383 billion. Therefore, average daily values are given in fig. 1.1 (based on the data of coinmarketcap.com). Figure 1.1 shows a graph of the weekly cryptocurrency market change from July 2, 2017, to December 17, 2017. Over this period, market capitalization increased from $94.7 billion to $590.2 billion, a growth of 3,234% relative to the start of the year. Over the past week (December 11-17, 2017), total market capitalization grew from $383 billion to $590.2 billion (as of December 17, 2017). Despite the significant growth in cryptocurrency market capitalization in Q3 2017 and over the entire year to date, the market is susceptible to sudden and drastic fluctuations. Significant drops were seen during the week of July 9-16, 2017 (-28%), and over the first two weeks of September (September 3-10 and September 11-17, 2017), when the market lost $25.2 billion (-15.1%) and $20.8 billion (-15%), respectively. The highest growth rate in Q3 was 39% (the week of July 16-23, 2017). For the third week in a row the weekly growth in market capitalization equaled around $50 billion (from November 19, 2017, to December 10, 2017). Over the past week (December 11-17, 2017), total cryptocurrency market capitalization increased by a record $207.1 billion, or 54% (using average daily data). The total number of cryptocurrencies and digital assets listed on exchanges has grown since July from 881 to 1,325. Their number increased by 51 over the past week alone, from 1,274 to 1,325. Average cryptocurrency and digital asset capitalization increased from $300.6 million to $445.4 million over the analyzed period. Over the four weeks of October (October 1-29, 2017) the cryptocurrency market grew by $23 billion, from $147 billion to $170 billion, and over the following four weeks of November (October 30-November 26, 2017) it reached $283 billion, i.e. it increased by another $113 billion. During the first two weeks of December (November 27-December 10, 2017) the growth totaled another $100 billion, bringing it to $383 billion (average value on December 10, 2017). Last week (December 11-17, 2017) was characterized by very significant market growth of 54%, with this growth being driven primarily by altcoins. Bitcoin dominance fell somewhat over the week, from 60.9% to 56.3%. Overall, the cryptocurrency market grew significantly, with its capitalization increasing by a factor of 33 since the start of the year (from $17.7 billion to $590.2 billion on December 17, 2017). 2 Average token reward for ICO projects was calculated for August-November as of December 2, 2017. Consequently, token reward or the ratio between the current token price and the token sale price, i.e. the average reward per USD 1 spent on tokens during the token sale, if they are subsequently listed for USD on a cryptocurrency exchange, is $2.72 for projects completed in November 2017. To calculate this ratio, the authors used the data from 50 ICOs completed between November 1 and December 1, 2017. The maximum token reward for projects completed in November was 7.99x for the Genesis Vision ICO (based on the assessment made on December 2, 2017). 4 The data for many ICOs completed after December 1, 2017, are incomplete or non-existent. The data since the start of December (December 1-10, 2017) were adjusted to account for the appearance of more complete information on past ICOs. In all, the total amount of funds collected equaled $304.2 million. Last week (December 11-17, 2017) the amount of funds collected via ICOs equaled 345.9 million. 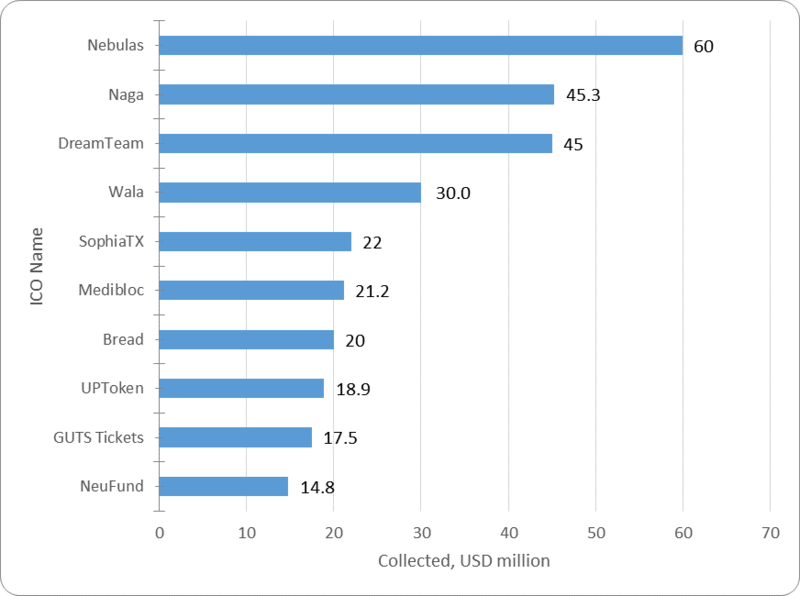 This amount includes the results of the 18 most successful completed ICOs, with the largest amount collected equaling around $60 million (Nebulas ICO). The average amount of funds collected per project was $19.2 million. More detailed information on the 18 ICOs completed last week is given in Table 2.5. The number of projects conducting active ICOs as of December 17, 2017, is 269. There is presently information available on at least 267 planned ICOs to be conducted after December 17, 2017, including more than 10 ICOs which will start next week. 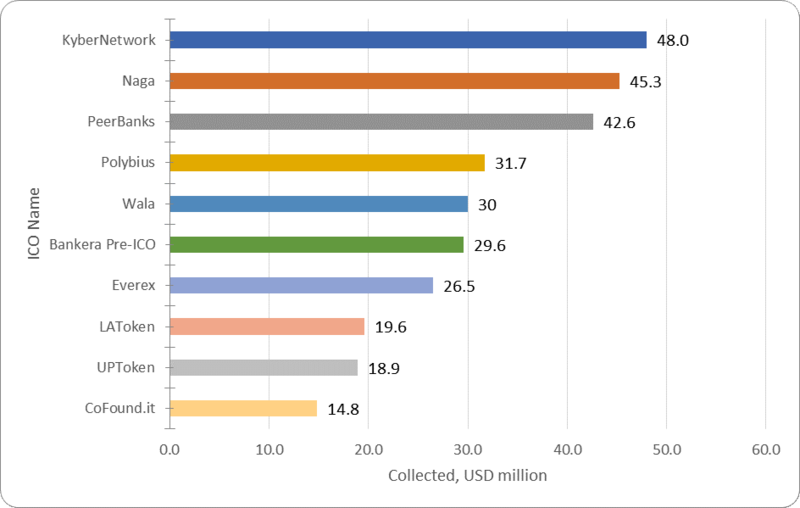 Table 2.4 shows that the greatest amount of funds was collected via ICOs in June 2017. In that month, the average collected funds per ICO equaled $33.17 million. The data for last week (December 11-17, 2017) may be adjusted as information on the amounts of funds collected by completed ICOs is finalized. Table 2.5 shows the top 18 ICOs which were successfully completed during the past week (December 11-17, 2017). The leader was the Nebulas project, which is a decentralized search platform for blockchain. The ICO was built on the principles of the value of information, self-development and incentivization. Traditional tools will also be sold under the project: smart contracts, a domain name system, wallets, etc. 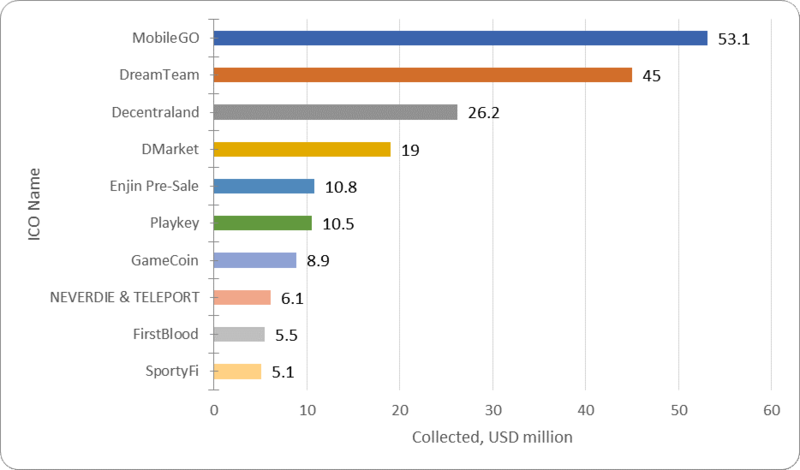 Figure 2.2 presents the ten largest ICOs completed during the past week of December 2017. The list of top ICOs for the week includes the following categories of ICO projects. *** The projects in the Top 10 of this category completed in December 2017 are highlighted in red. Table 2.6 lists the top 10 ICOs in the Infrastructure category. Nearly all of these projects were performed in 2017. The highest token performance indicator, i.e. the ratio of current token price to token sale price, is 8.53x for the EOS ICO. Its current market capitalization equals more than $4.6 billion. The ratings of ICOs in the Finance and Gaming & VR categories are given below. ** The projects in the Top 10 of this category completed in December 2017 are highlighted in red. At present, all projects from the top 10 in the Finance category have a token performance indicator of 1x to 6.8x. The exchange listing of the KyberNetwork ICO can be considered one of the most successful, as this project has a current token price to token sale price ratio of 6.8x. When considering this indicator, it is important to remember that the KyberNetwork ICO was completed on September 15, 2017, i.e. the 6.8x growth took place over approximately three months, and the market capitalization of KyberNetwork currently exceeds $370 million. Table 2.8 shows the top 10 ICOs in the Gaming & VR category. Half of the projects presented are selling their tokens on cryptoexchanges. The capitalization of the leader in this category (the MobileGO project) is currently $65.5 million. Over the past period (December 11-17, 2017), 18 ICO projects were successfully completed, each of which collected more than $100,000, with a total amount of funds collected of at least $345.9 million. The week’s leader was the Nebulas project ($60 million). The total amount of funds collected by a number of ICOs failed to reach even the $100,000 mark (the information for some projects is still being finalized). Not Mineable A coin that is not mineable. The term is used for cryptocurrencies (tokens) which cannot be mined or issued through mining. ZAK-8 Crypto index calculations include the trading volume and market capitalization for eight cryptocurrencies: Bitcoin, Ethereum, Bitcoin Cash, Ripple, Litecoin, DASH, Cardano, and IOTA.